Murder. I couldn’t stop thinking about it—in the book I’m reviewing, the book I’m reading, and the book I’m supposed to be writing. I live on the Isle of Arran, a small slice of heaven off the coast of Scotland, so I decided to go for a walk. Usually, this means the beach but somehow, today I needed more. 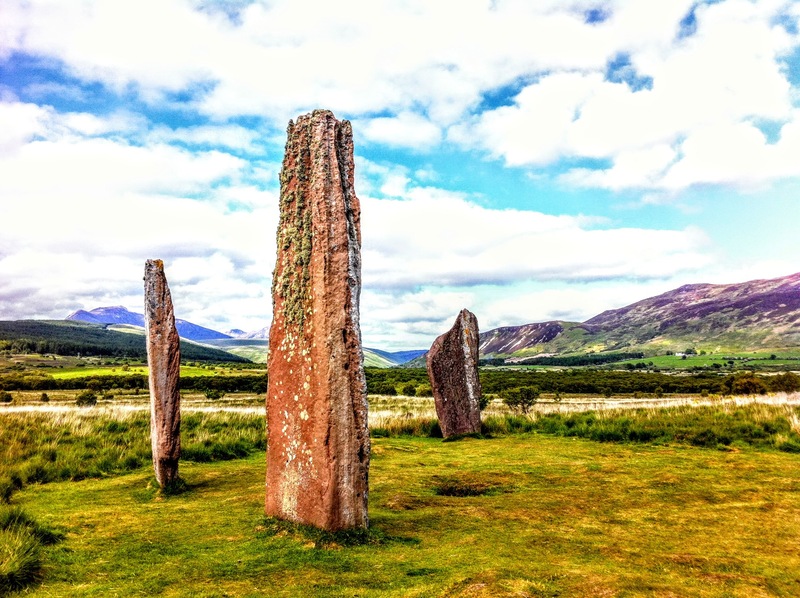 Lucky for me, about 5000 years ago, Arran residents must have known this day would come, and decided to erect rings of massive standing stones, stone circles, and cairns in precise patterns that extend over a two mile area. We can see the results but we can only guess at their motives, their means, and even their identities. The perfect whodunit. To get there, you need to hike across a mile or so of sheep meadow, which is especially fun this time of year as lambs stare at my dog before pronking off on lambly business. All very fun until I noticed a lamb baa-ing at a sheep lying on the ground, head at an odd angle, eyes closed. As we got closer, the sheep didn’t move. Wind ruffled its ears, the lamb snuffled around, and the sheep was immobile. I had my little dog with me, and didn’t dare go too close in case the farmer thought my dog was a sheep-worrier. I turned to look just before the path turned, and the sheep was still there, unmoving against the background of the derelict old farm. The Standing Stones were as moving as ever, awe-inspiring in their mystery. How did these massive stones—non-native to the island and planted as deep in the ground as they stood above it—get here? And why? It’s strange to think that events leading to their creation and meaning were so consuming thousands of years ago that people would have marveled at the idea of a future in which their purpose would be unknown. What mysteries are we leaving for future eons to wonder about? Windmill farms? Fidget Spinners? As we walked back, I couldn’t help watching for the dead sheep and the bleating lamb beside it. It had been over an hour, but of course the sheep hadn’t moved. It was lying as before, head twisted at that odd angle. As we walked past, the lamb took a few bounces toward my dog. And the dead sheep shook its head and sat up. Was this some kind of sheep joke? Not much happening up there on the moors, so they invented sheep theater? Did some of the lambs have iPhones on selfie sticks, and even now the pictures of my dropped jaw were making the rounds on their Facebook pages? I didn’t have time to think about it, of course, because the perfectly-executed fake death had given me an idea for my book chapter, next blog post, and overdue book review. My laptop was calling. When a homosexual Dutch art dealer hides the stock from his gallery – rather than turn it over to his Nazi blackmailer – he pays with his life, leaving a treasure trove of modern masterpieces buried somewhere in Amsterdam, presumably lost forever. That is, until American art history student Zelda Richardson sticks her nose in. After studying for a year in the Netherlands, Zelda scores an internship at the prestigious Amsterdam Museum, where she works on an exhibition of paintings and sculptures once stolen by the Nazis, lying unclaimed in Dutch museum depots almost seventy years later. When two women claim the same portrait of a young girl entitled Irises, Zelda is tasked with investigating the painting’s history and soon finds evidence that one of the two women must be lying about her past. Before she can figure out which one it is and why, Zelda learns about the Dutch art dealer’s concealed collection. And that Irises is the key to finding it all. Her discoveries make her a target of someone willing to steal – and even kill – to find the missing paintings. As the list of suspects grows, Zelda realizes she has to track down the lost collection and unmask a killer if she wants to survive. 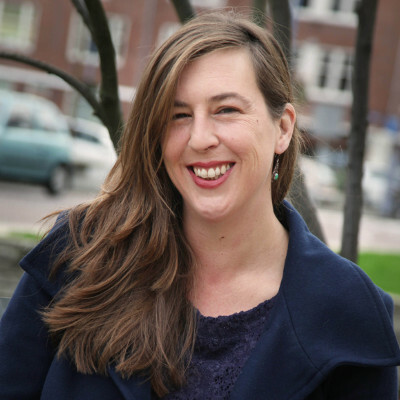 Jennifer S. Alderson worked as a journalist and website developer in Seattle, Washington before trading her financial security for a backpack. After traveling extensively around Asia and Central America, she moved to Darwin, Australia, before finally settling in the Netherlands. Jennifer’s travels and experiences color and inform her internationally-oriented fiction. Her novels, Down and Out in Kathmandu: adventures in backpacking and The Lover’s Portrait: An Art Mystery, transport readers to Nepal, Thailand and the Netherlands. Her travelogue, Notes of a Naive Traveler: Nepal and Thailand, is a must-read for those interested in learning more about, or wishing to travel to Nepal and Thailand. “Write what you know.” Like most vintage advice, there is a kernel of truth to that, especially if you interpret it as “take what you’ve experienced and use it to inform and color what you write”. Jennifer S. Alderson is certainly one writer who takes that advice to heart. Like her character Zelda, she was working as a website developer in Seattle, Washington, when the travel bug hit. After several international stops, she ended up in the Netherlands, pursuing a graduate program and internship in exhibition design and collection research. In book two of this series, Alderson’s fictional doppelganger, Zelda, is counting on her internship at the Amsterdam Museum to ensure her admission to the prestigious graduate degree program in Museum Studies. But Zelda is disappointed to discover that she’s really only expected to work as a copyeditor, proofing english translations of the catalog copy. Museum curators and staff have been working for years to prepare for an exhibit of unclaimed art works recovered after Nazi occupation in World War II. Interleaved with Zelda’s contemporary research are chapters set in 1942. In them, the history of the missing artworks unfolds against a backdrop of war, blackmail, the holocaust, and homophobia. When Zelda offers to apply her web development skills to enhance the museum’s dreadful online site meant to showcase each work of art, her efforts are mocked and rebuffed by exhibition curator Huub Konijn. But before the new website can be taken down, they get their first hit. An elderly American, Rita Brouwer, whose family had fled Nazi-occupied Amsterdam when she was a child, came forward to claim Irises, one of the lesser-known works. The museum administrators are delighted, and quick to publicize their first success. All that turns to dismay when another claimant to Irises emerges. Curator Huub is sure the new claim is valid, but Zelda is convinced that the picture belongs with Rita and her elderly sisters. As Zelda and her young friend/admirer Friedrich dig deeper, the stakes go from lies and greed to murder. There were so many things to like about this book. The premise—Nazi-looted artworks hidden for decades—is both timely and terrific, and the settings were well-drawn and believable. Nazi atrocities against both Jews and homosexuals are well-documented. And we’ve all heard about families who’ve spent years trying to recover property looted by the Nazis, as well as the dramatic discovery of more than 1200 works in the apartment of reclusive German art dealer Cornelius Gurlitt. Plus, as a thriller, the novel’s pacing unfolds perfectly, slowly at first and then racing to its dark climax. For me, though, there were a few problems with the book. I can wish for tighter editing for the various typos and edit fails (including the instance where Huub calls someone “Renee”). I can wish that better research/editing could have caught things like the reference to a non-Jew as one of hundreds of guests at a bar mitzvah party, even though such an event would have been more likely to be a family-oriented dinner feast in the days preceding more recent American-style extravaganzas. Or that while there is a definite point made to one character wearing a wig, we never really find out why. Some things were probably just artistic license taken in order to make a point, such as the unlikely conversation between an art history graduate student and a museum curator where they discuss the meaning of “provenance”—something that should surely have come up on the first day of her first art history class. Or the way that the Nisqually earthquake was moved forward in time…and relocated from Olympia to Seattle. But my real disappointment with The Lover’s Portrait is with the main characters, especially Zelda. We know that she’s an intrepid woman who has traveled the world. Trying to avoid spoilers, I have to say that she comes across as immature and surprisingly gullible, especially in her romantic relationships. Despite what I would have seen as opportunities for character development and growth, I can’t point to times where Zelda has changed or matured in any way. And—while trying to avoid spoilers here— I can also say that the other “romantic” relationship between the villain and his accomplice is even less believable. In addition, virulent opposition of curator Huub to giving Irises to its original owner and his almost fawning acceptance of the second claim is vaguely attributed to his own family’s suffering during the war. While the plight of the Netherlands Jews is well documented—of the over 140,000 Jews living in the Netherlands at the beginning of the war, less than 27% survived the holocaust, and those who did almost invariably returned to find their property confiscated and possessions gone—that simply doesn’t explain why he would prefer one claimant over another. Having said all that, I come back to the fact that this is a well-told story over all, with significant research, great settings, and good pacing. Author Jennifer S. Alderson can definitely write, and I’d look forward to reading her future books. I reviewed The Lover’s Portrait for Rosie’s Book Review Team. Connect with Jennifer via her website, blog, Facebook, Goodreads or Twitter. I have four kids. ALL the good lines have been used against me. 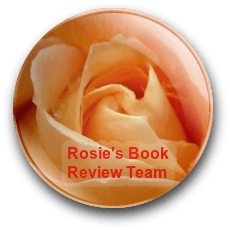 Thank you for choosing to review The Lover’s Portrait for Rosie’s Book Review Team! I appreciate knowing what did and didn’t work for you. Most of all, I’m glad you enjoyed it! I’m so glad the sheep is OK! Wouldn’t want a momma-less lamb. No baby lambs were harmed in the production of this blog post. Love the idea of the lambs with selfie sticks and laughing their heads off at the joke mamma sheep played. They just can’t get a decent TV signal up there, so sheep have to make their own fun.